The good news is that there are no verb tenses in the Chinese language. Many other languages have imposing ranks of verb conjugations to indicate past, present, future, perfect, and so on, the degree of complexity varying with the language. With Chinese, there is only one sound/word, and character, for a given action (not counting synonyms, see notes below). The time factor is addressed by “time words” at the beginning of the sentence when necessary. However, there is a way to show that an action is completed. It is so simple as to seem almost silly. All that has to be done is add a “le” sound a the end of the sentence. Learning to add these types of meaningful sounds at the end of Chinese sentences has been both fun and embarrassing for me. It is fun because it is a bit sing song. All of the “important” words, with distinct meaning, have already been said, then you go and add this sound that reminds me of singing “la la la.” Most of these ending meaning-indicator sounds are “neutral” tones, which basically means midrange tonally, but, most importantly, very short compared to the other tones for most of the main words. There is 嗎 (ma.) for questions, 吧 (ba.) for suggestions, and 了 (le.) for making it clear that something has been completely done. It can feel embarrassing or awkward, because until one is used to it, it feels like adding an unnecessary sound. In English, we don’t have individual sounds that are important for understanding a sentence. Tone matters, but it is incorporated with the English words we are using, not isolated. The Chinese meaning-indicator sounds are like singing punctuation! Upon reflection, though, English speaking parents should be jealous of this little Chinese trick. Sometimes, we just want to know if the kids are finally finished with something. The options in the English language can be frustrating to listen to, giving play to many excuses. In Chinese, they should know you are just listening for the 了 (le. ), and leave it off at your own peril. In my last Chinese lesson, we practiced quite a few sentences using this ending. My ear soon became adjusted to the sense of finality that it added to the sentence. For instance, if I say the Chinese sentence below, I suspect people are less likely to argue about my decision to be done eating. He has completely drunk my lemonade! if he gives me flowers, because he knows I very much like flowers. In the first Chinese phrase directly above, you may notice that the verbs occur earlier in the grammatical order, but the (le.) can go right after the verb or at the end of the sentence (or phrase if the sentence has more sections). My money is used up. Today my time is used up. I finished running the marathon. Everyone would like to be able to say this about time and money. I have finished writing this blog post! ❷ This 把 is also a “ba” sound-punctution word, but is written with a different character. It is used when the direct object (that is the noun receiving the action of the verb) is being put in front of the verb. For example, in English, we might say: He drank my drink. “My drink” is the direct object. If we say, “My drink he drank.” it might be awkward or archaic sounding, but you would probably know what was meant. If it was rearranged to say: “My drink has been drunk by him.” the “by” combined with the change in verb conjugation are serving a similar function to the Chinese “ba”. 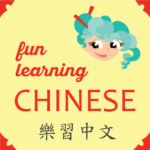 ❹ I find it fascinating that 花 (hua1) can be and is commonly used to mean either “flower” or “to spend,” a good example of how context makes the difference.